Great commentary, but what must be said and what was clearly overriding to allow the successful deployment of these tactics is that Italy’s defense was hobbled at best. Chiellini should not have started in his condition. He was initially in good position to beat Cesc to Iniesta’s through ball but could not stride to it, conceding the unchallenged cross for the first goal. De Rossi’s feeble attempt to channel the Alba run was also a result of fitness, as were Barzagli and Bonucci’s lethargic efforts to clog the passing channel. There was no concern for combination on the play; it was very straightforward, just an exhausted defensive response. 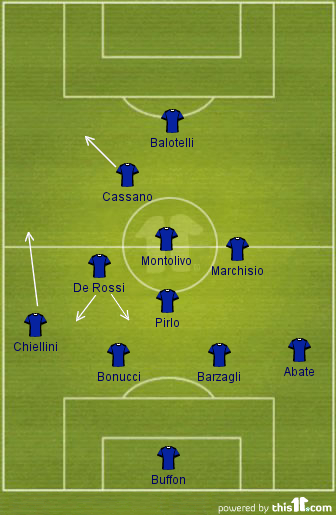 The reason for Spain’s best game at this stage was Italy’s defensive physical fitness was at an all-time low. Spain basically showed what they can do in training against pylons. It is a shame that the tournament does not allow for a little more recovery time to truly allow for a great competitive game. Italy, given their recent fitness issues, particularly to their defenders, needed at least one more day like the Spanish had to make the game worth playing. Unfortunate. They gave it their all, and now they’ll be paying for it with permanent muscle lesions. Come on Euro tournament. You can do better. It is true that Spain had one day’s more rest than Italy to prepare for the final. This must be considered against the fact that Portugal has two days more rest for the semi final against Spain and yet it was Spain who were the dominant side and physically stronger during the extra time period. With hindsight perhaps Chiellini should not have started and Balzaretti provided better options on the left but is not as sound defensively. At the final, both teams are tired. I don’t think either enjoyed a particular advantage but one day’s more rest and better preparation would aid all teams in future.